Lukas' birthday party was yesterday and it was a huge success! The day was HOT, especially for June in Seattle, with temperatures reaching 92 degrees in the brilliant sunshine. Mrs. LIAYF and I mitigated the heat as best we could absent any air conditioning (hey, it's Seattle for crying out loud, where AC is needed maybe twice a year) with plenty of cold drinks, umbrellas for shade, and floor fans to circulate the hot air around. An early disaster was narrowly averted, when we checked out the back yard early on to find the sidewalk next to all the kid toys swarming with biting ants. I felt a bit sorry for the little guys, but didn't hesitate to pull out the hose and wash them away, down the hill into our back alley. A guy has to protect his family and guests, no? Luke, despite being over tired from a short nap (see heat note above) and teething pain (all four molars are now close to breaking), was on his best behavior. He played nicely with the 10 other kids who showed up (all boys - there is a dearth of little girls in our city, so there should be serious dating issues in about 15 years! ), walked all over the house and yard to show off his newly "perfected" skill, and was his usual charming, cute, social self with all the other guests, familiar to him or not. We read many articles about making the 1st birthday party small to keep it from overwhelming the birthday boy, but we had close to 40 people pass through yesterday, and Luke was only fussy a couple of very short times despite the heat and teething and that was when he was hungry and needed changing. We asked that guests, in lieu of gifts, bring diapers to his party. Those, as mentioned in my last post, will be donated to Westside Baby, to help out other families in need. We want to teach Lukas early on, not to take what he has, be it fairly modest, for granted. There always will be people out there who are having a rough time, and we should do what we can to help them out. We collected a good sized stack of diapers and wipes to donate. Thanks so much to everyone who brought these thoughtful gifts. Many of those people still brought proper birthday gifts as well, which was unexpected but thoughtful and well received by Lukas, who opened them all and found several new toys that he bonded to right away. Mom and Dad didn't go overboard on gifts for Luke, but we did pull out this shiny new Radio Flyer roadster as his official 1st birthday gift! We bought this at a local auction about 3 years ago, knowing that someday we would have a little one to give it to. Lukas loved the car, as well as all the gifts. In the end, despite the heat, it was a very successful 1st birthday party. Good food, cold drinks, great company, plenty of sunshine, and lots of friends to play with. Every 1st birthday party should be as nice! Happy 1st Birthday Lukas! Yes, it was one whole year ago that our son first made his appearance in this world. At exactly 12:07 p.m. Pacific time 366 days ago (remember that Leap Year!) Luke ended his long journey to the light of day, with one final exhausted push from Mrs. LIAYF after enduring a marathon 80 hour labor. We joked at time that we hoped the labor wasn't an indicator of the struggles to come. We have had struggles, indeed, but Lukas has been nothing pure joy for us ever since that rainy northwest June day he came into our lives. His development, chronologically, was near 10 months but his journey to becoming our son spanned five years. We have often said to each other over the past year that our long battle with infertility, while painful for sure, was necessary so that this little boy would be the one who came into our lives. Apparently Lukas was the one for us, and we for him, so the wait was well worth it. I can not even begin to properly articulate what our son has meant to Mrs. LIAYF and I. Where there was a void there is no more. Where there was pain and sorrow, there is now joy and laughter. Where there was drudgery, there is now anticipation and happiness. Yes, we are truly the luckiest of parents to have been given this gift. Lukas has evolved over the last year from a tiny infant to a full-fledged little boy - walking, "talking" and laughing. We wanted to do something fun for his birthday, with just him and his parents, so we plan to go to the zoo. Lukas has had only one previous zoo visit, in the middle of December when it was so cold that the animals stayed inside to keep warm! This trip promises to be much better as the weather will be in the upper 70's with lots of sunshine! Plus, Lukas loves his stuffed monkey, so we hope to see lots of different varieties of monkeys today. Sunday will be the birthday party proper with many friends and family visiting. Many of those attending know how long we tried to have a child, and know just how wonderful this milestone is for us. Since we are lucky enough to be able to provide everything Lukas needs, and because he also won't remember gifts at this age, we have asked attendees to bring packages of diapers for Westside Baby - a non-profit that helps out families in need. There's plenty of loving families with babies and small children who just need a little help, and we are glad we can do this small part. Thank you, Lukas, for choosing us to be your family. I'm sure you won't remember your first birthday, but your mom and dad are over the moon! A great culmination to a terrific year! The concern was real. Lukas was tired. He didn't need something like this to jeopardize his precious sleep. But there it was, big (gigantic really), loud and ugly. We were getting Luke ready for his bath when it appeared, menacingly present as we lowered our boy into the tub. After a couple of annoying close range fly-bys, I realized what must be done. This behemoth was not going to make it into our son's room as we closed the door for the evening and put him down into his peaceful slumber. No, he could not be allowed to harass my little guy all night! Thinking quickly on my feet, I grabbed an old magazine (most likely a catalog for kids products), and rolled it into a tight, rigid tube in my trustee right. Deprived of many manly pursuits since the birth of my son, my adrenaline level jumped as I prepared my body for what was to come. This was war. This was personal. 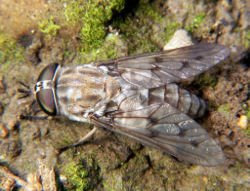 This horsefly had to DIE! In a brilliant first move, I grabbed the bathroom door and shut it almost without thinking. Yes, it was now to be a cage match between myself and my hideous opponent. I could sense that he also understood what this meant, as he did another fly-by to size me up. He must have realized that if he landed his life would be mine in one swift stroke of death, because he continued to circle the bathroom, hoping against hope that I would wear myself out first. But I played my hand in a different way, friend. Yes, I guarded that door rock solid, not flinching, waiting for my opponent to make his mistake. And make a mistake he most certainly would! But he continued to bob and weave, light on his wings, after a while running on what must have been pure adrenaline. He was Frazier to my Ali, continuing to circle me, back and forth, looking for a knockout punch, while I hung out on the ropes and patiently waited for that moment when he would finally wear himself down. He would float like a butterfly, but I would sting like a bee. After what seemed like an eternity he slowed. This was my chance. I would not let this opportunity pass me by. I raised my right, slowly. Trying to anticipate the very spot he would touch down so I'd have the death blow on the way a fraction of a second earlier. I heard it at that very moment. The unmistakable sound of a window sliding open. Mrs. LIAYF tired of waiting and watching. How could this be? He did not hesitate. Seeing his life handed back to him, Frazier pivoted on a dime and made tracks for the open window, flying off peacefully into the night. Leaving me there to ponder what might have been. Cue the Benny Hill music . . . . another weekend arrived with yet another Friday night trip to Home Depot. I would save all the frustration caused by the crappy service (employees who are no help whatsoever) if I weren't such a cheapskate and instead shopped at a non-chain, non-mega home improvement store. But then again, who else is going to be open until 10:00pm on Friday night? Thankfully, I do see a light at the end of the tunnel on the deck project. Again, I remind myself not to do these home projects myself, but I always forget how much they take out of me and start another project anyway (I hear that this is how the second pregnancy happens too). The deck has really taken a toll on my bum right knee. It has been bothering me for years really and, being in managed care I never really had a proper diagnosis until recently when my HMO sent me over to a local hospital they contract with when they are booked up on appointments. The referral hospital happens to have an excellent Orthopedics team and they immediately diagnosed me with a Meniscus cartilage tear. They recommended surgery that would require three weeks of recovery (and no driving for a week). That was a few months ago. Since I drive Lukas to and from day care, and have been busy getting the house in order for his 1st birthday party, I have put it off. I finally decided, with some helpful prodding from Mrs. LIAYF, that there would never be a good time to get this done. Plus trying to do all the fun things I want to do with Luke on a bad knee which will never heal itself, was not something I was willing to accept. Lukas is walking, and getting more and more mobile every day. So, I finally scheduled the surgery. I will deal with the inconvenience for a few weeks to not have it bother me as Luke gets faster and faster on his feet. Lukas is becoming less like a baby and more like a little boy every day. For instance, he has added a couple of more words to his repertoire. He is now saying "nigh-nigh" at bedtime, "ma-ma" (finally, to the relief of Mrs. LIAYF), and just this afternoon he started saying "ah-ba" whenever our feline freeloading cat Albert walks by (which is rarely since the cat mostly lays around the house all day and does nothing). Luke seems to really be expressing himself quite well recently and I can anticipate he will be holding very detailed conversations with us in the near future. Finally, instead of just pulling his books off the bookshelves and stacking them in a messy pile, Lukas has started to select one and for us to read. He grabs the book, walks or crawls over to one of his parental units, and says "da-do" (translation: "please read me this fine piece of literature so that I may someday grow up to be a Pulitzer prize winning author and be able to support my wonderful parents in the princely manner you both deserve"). He then hands one of us the said book and actually climbs up into a lap for some good reading time! Amazing! With our little boy growing up so quickly, I'd better get my bum knee fixed soon! My surgery is on July 7th - wish me a speedy recovery. Please forgive me if you are squeamish about such things. As Luke's 1st birthday rapidly approaches, you may notice that the tone of my posts may be a bit overly warm and fuzzy. Some may even say sappy. (what, you think most are that way?) Hey, new dads have a pass when it comes to that and I still consider myself a new dad. At least until the end of the first year anyway. The culmination of this first year, my first year as a parent, Lukas' first year on the 'outside', the first year of memorable moments has me feeling all good on the inside, as well as a bit distracted. I often catch myself daydreaming about all we (Mrs. LIAYF, Lukas, and I) have been through in the past 358 plus days. All the wonderful 'firsts' we have been able to experience with our son, as well as all of the challenges that we have overcome together which have solidified our family bond. Mrs. LIAYF and I have always been very close and wonderfully happy together, but the addition of this child into our family has been so much better than I could have imagined, or did for that matter. Luke has brought to my life a new level of happiness. Before having a child I knew I would love the child, but really, to me that was only a concept. Of course a parent would love a child. I didn't know what the other parents reading this post knew after their children were born. It was just that concept to me. Now though, with his birth and first year, I have that complete understanding. That reality. That sense of love and protectiveness that is so strong at times that it hurts. No, I would not have to think twice. My body would take over for my mind because that feeling now permeates every muscle and nerve ending I have. It would be instantaneous. Without thought. Now, I now really KNOW what that old saying actually means. Yes, I would throw myself in front of a bus to save Lukas' life! My first Father's Day is in the books and it was a great day. After a delicious breakfast and some great gifts from my family, I spent the morning getting a bit of work done on my deck project (which is progressing much slower as well as costing much more than we had originally estimated. But you have all been there, right?). Thankfully Mrs. LIAYF, along with Lukas, rescued me by convincing me to take the afternoon off and enjoy the beautiful sunny Father's Day afternoon here in Seattle. Sun has been in short supply recently so we needed to seize the day. She had a terrific idea that we should install the Wee Ride and take a spin down past the the world's most beautiful bus stop to Alki Beach for Lunch. It was Luke's first time on a bike and he seemed to enjoy it immensely, although perhaps not nearly as much as I did. After spending the past few weekends without any downtime, this was the best Father's Day gift that I could have received. It was fun, scenic, relaxing, and all of the recent stresses I have been feeling seemed a thousand miles away. After a satisfying lunch, and a trip to the park to give our son a ride on the swing, we decided it was perfect timing to introduce Luke to yet another first and rite of passage for all kids the world over. His first ice cream!! Since Lukas had never had ice cream before, it was a special treat to get a big scoop of fresh made vanilla at our local deli and see just what his reaction would be. Initially, he was a bit surprised at how cold it was, but after that shock wore off, Luke was all into and digging his new treat. We all sat back, relaxed, and enjoyed our little slice of heaven for a few satisfying minutes before gathering up our gear, strapping Lukas back into his bike seat, and heading home for the evening. In the end this turned out to be a great afternoon and a first Father's day to remember. Just like the ice cream for Lukas, the day was a perfect treat for this new father! I feel like an impostor when I even consider it. I am such an amateur at this parenting thing. It's like a kindergartner teaching college calculus, or the Grape Ape lecturing on recent advances in peanut growing techniques. You would smile politely and think that it was cute, but you wouldn't rely on Grape's knowledge when the time comes to plant your own peanuts, now would you? Really? Well, here it goes. My first piece of advice as an experienced father of a happy one year old: Let your baby learn how to put himself or herself to sleep! It made all the difference in the world for Lukas, and for our sanity as well. Mrs. LIAYF and I spent the first 6 months of Luke's life severely sleep deprived. He wouldn't sleep more than a couple of hours at a time. We were trying every 'trick' in the book to get him to sleep including swaddling, pacifier, nursing him to sleep, rocking, you name it we tried it. We cringed at the thought of letting him cry himself to sleep, and we went immediately to help him when he woke in the middle of the night. We didn't have to heart to let our son cry when we knew we could do something to make him feel better. It didn't occur to us until later that he was training us to come when he cried, because he relied on us to put him to sleep. That was our failing at the time. (1) Babies and toddlers need 13-14 hours of sleep a day!!!!! This includes 2-3 naps per day until age one, and 1-2 naps after that. (2) Babies respond to a consistent nap-time and bedtime routine, which will cue them that it's time to go to sleep. (4) YES, babies will cry when as they learn to put themselves to sleep, but with consistency the baby's response improves quickly. With these guidelines in mind, there are several ways to put a baby to bed - sitting next to the crib, sitting in the room, leaving the room and checking on the baby. All involve a bedtime routine, putting the baby in the crib awake and NOT picking up the baby after you put him in the crib (unless they are sick or otherwise need special attention). This can be painful for parents who rush to pick up their baby every time they cry - as we did. Yes, Lukas did cry for over 2 hours that first night before putting himself to sleep. We were there in the room with him and soothed him every 10 minutes or so. When he later woke in the night, we waited 10 minutes before going in to soothe him. I would go in, rather than Mrs. LIAYF, because we decided to skip the night nursing. Yes, it was excruciating the first night, but it got much better the next night, better yet the night after that. Within days Lukas was SLEEPING THROUGH THE NIGHT and napping like a champ! We also noticed he became much happier with the extra sleep. Since then, barring the minor blips during developmental phases and the nasty cold and flu season, Luke has been a terrific sleeper. We put him to bed at 7:30 and use the same routine every night. Now he sleeps pretty soundly (knock on wood). This routine gives Luke the rest he needs to regenerate for the next day, and also gives us a bit of down time together in the evening to unwind. Everyone wins! We wish we would have considered sleep training much earlier with Lukas. The crying didn't hurt him any - it was just his only way to communicate that he didn't know how to put himself to sleep. Now, he goes to sleep without any crying at all and enjoys his bedtime routine - he will actually let us know when it's time for him to go "night-night." Hopefully, some new dad will stumble upon this post someday and reap the benefits for his own little one. There it is, my first piece of official daddy advice. Yes, I finally feel like a real dad now! I have just completed another weekend of deck improvements/repairs. Mrs. LIAYF and I decided to move the stairs to our deck to open out to our lawn rather than off to the side and down to a little used concrete patio. Although much more work now that we have to do major construction (you know how those things go, right? What seems like a hundred trips to Home Depot to get that one little thing that you don't have or couldn't anticipate last trip! ), it will be much nicer and definitely more family friendly once we complete the project. We found the Army radio operator under the steps, half buried in dirt and moss. The deck has been there for at least 30 years. The house has hosted a number of families before we purchased it (it is a 1909 Craftsman), and the last owners had no children, so I am sure he has been down there for years. Looks like he has been trying to call for help for quite some time to no avail. I think we saved him from certain peril, since there was one ugly spider about twice his size (a Brown Recluse, perhaps) lurking menacingly close by. Those are very big and very poisonous, so the spider prematurely met its doom. The Army man was saved, and has moved into the house. It is difficult to work on large home projects with an infant in the house, so it looks like we have at least a couple of weekends and some evenings of work still left to complete the project before Luke's first birthday party. We are sweating it a bit now, but know that we will be loving the newly configured space for the rest of the summer and for years to come as Lukas grows up! We anticipate that he will stash one of his own toys under the deck someday for some other little boy to find! I'm not sure exactly why, but I just didn't feel right yesterday. Maybe it was the culmination of a long week at work following a busy weekend working on our deck. I have also been having trouble sleeping this past week, where I would wake up in the middle of the night and not be able to go back into any kind of good pattern. This all resulted in very little downtime for me recently, with my feeling drug out and tired as well. It very well might have manifested itself in how I was feeling yesterday. Add to all this the fact that Lukas' daycare has been pushing a new napping schedule recently, one that has him taking one nap during my lunch hour, when I would normally go and see him during the workday. I had not been able to see him much all week and so was missing him more than I realized. I called Mrs. LIAYF around 2:30 and mentioned that I was having a rough day. "Why don't you go over and see Lukas?" was her response. "Well, I don't want to upset him and if I went now he would likely think it was time to go home and would be upset when I left him a few minutes later". "Go, over and see him! He will be happy to see his daddy," she insisted. I couldn't argue with that, so I went over and paid my son a visit. Mrs. LIAYF was right. Luke was very happy to see me, but not nearly as happy as I was to see him. After 20 minutes or so sitting with him, reading books and just enjoying a moment of being a little boy, my mood brightened. The past week's troubles melted away like ice cream in the summer heat (which we have none of here in Seattle currently). My short visit was a good reminder of one of the reasons Mrs. LIAYF and I were so looking forward to becoming parents . . . the opportunity to slow down and to see life from a kid's perpsective. After a hard week, Lukas was just what the doctor ordered. Hey, my calendar says JUNE 5th! What the heck is going on here? This "B.C." comic strip was passed around my work today, and everyone got a good chuckle. But, we all groaned as well because it can be so true sometimes. No problems, though. Check back with me in mid-August when it will be 80 degrees, sunny, and GREEN here! Until then, I hope it's sunny and nice where you are! I was going through some recent photos Mrs. LIAYF took of Lukas and I laughed a bit to myself about this one. At first it reminded me of the yodeling mountain climber from 'The Price is Right' game show. That was, until I Googled that term and actually resolved the mental picture I had with the real thing, which was a mountain climber in lederhosen with a pick axe, actually hiking upright up the mountain. It's funny how certain images trigger memories from childhood. As demonstrated in this photo, Luke has shown an insatiable propensity towards climbing. As such we have to be very careful of where he is at all times so we can mitigate the inevitable falls that go along with it (Mrs. LIAYF was close behind him all the way to the top). I am very excited about the climbing though, and hope it translates to when he is a bit older. Here in the Pacific Northwest, we are lucky to have abundant, accessible and scenic hiking trails suitable to all skill levels. I look forward to the day when I can take my little guy out on day trips to hike, explore, and generally enjoy the beautiful outdoors we are lucky enough to live amongst. Yes, the benefits of having a child seem endless. The least of which is daydreaming of all the great things you are going to do together! Including, of course, following close behind him to catch him when he falls. We have been part of a new experiment in grocery shopping over the past few months. Amazon.com has begun a new fresh grocery delivery in the Seattle area and our household has been a steady customer ever since we first heard about this new service. Shopping for groceries on-line has not only been fun, but it has left us more time to spend with Lukas and each other in the evenings or on weekends. Yes, we love our local farmer's market and organic grocery store (PCC rocks! ), but it's great to have the staples DELIVERED to our door! 1. Yes, the price can be higher for certain items as compared to shopping at our local Safeway, with its club card, but there are many items that are actually lower priced than the big chain groceries. Over all though, the price is a bit higher so it pays to use this service only for necessary items. Note: you can't use coupons, so that's a bummer. 2. The service is extraordinary! You can get online, order the items you need, and select a pre-dawn delivery to your doorstep by 6:00 AM. The drivers are very quiet as well. Our bedroom sits right above our front porch (with wooden steps) and we rarely, if ever, hear them when the delivery is made. Also, if we are ever unhappy with anything that we have ordered, we just shoot Amazon Fresh an email and we are either refunded right away, or they replace the item in the next order, at no charge. 3. Unattended overnight delivery is FREE! This only happens with orders over $25.00 (compare to Safeway.com which is $10 for every order), but with the cost of food items these days, getting an order of this size is no problem at all. This really comes in handy when it is late at night and you realize you need that particular item for morning and can't, or don't want to run out to the store. Tonight we ran out of milk and I will be placing an order shortly. 4. Being a relatively new service, the item you need may often not be in stock. You can, however, get an alternative by using the easy browsing feature of the website. Once we ordered two gallons of Organic Valley non-fat milk and at the time of delivery, the milk was not available so Amazon substituted two gallons of Wilcox organic non-fat milk and didn't charge us for the replacement. This was over $13.00 in value! 5. You can use your preexisting Amazon account to sign in. 6. This service is only currently available in the Seattle, but when you hear about the service coming to your area, give it a try. The convenience you get and the great delivery policy can make a huge difference when you have kids. Oh, and no, Amazon Fresh did not pay for this post. Although, Mrs. LIAYF says they can definitely put some dark chocolate in our next order and call it even! !